cycle training has come a long, long way since fausto coppi's 'ride a bike, ride a bike, ride a bike'. 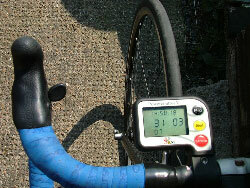 nowadays you have to have your heart rate, cadence, speed and power output. and you don't just want the numbers on a box on the handlebars - you want to be able to come home after that six hour ride and download all the data into a computer and spend the next six hours poring over the coloured graphs trying to figure out where you have room for improvement before doing it all again the next day. there are a couple of high profile devices for achieving the above: the cycleops power tap hub as used by phloyd and the srm chainset as used by everyone else. but let's face it, you either need to be a member of a professional cycling team or a particularly well funded individual to own one of either. a powertap sl 2.4 costs about £1000, and that's before you build it into a wheel, while the srm pro system costs at least £ 2000. what's a poor cyclist to do? 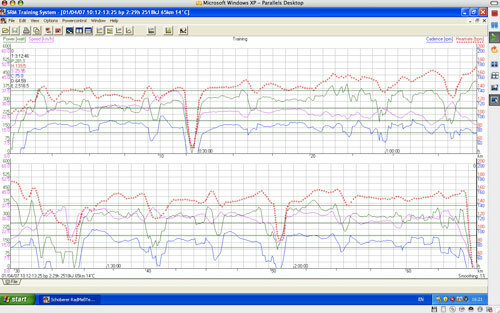 well, to be blunt, log on to cyclepowermeters.com and you can rent one of these systems from as little as £32 per month. now we're feeling better. so thewashingmachinepost, with absolutely no need of either device decided to 'rent' an srm professional set for a couple of weeks and find out whether it's all too good to be true. this was perhaps a more complicated situation than it need have been, but since other mac owning cyclists will run into the same problems, trials and tribulations, maybe i can lighten your load, so to speak. because i chose the srm unit, the software that supports the powercontrol box that clips to the handlebars is windows only. as you may have inferred from one or two other articles on the post, i dislike windows with a passion, so all my computers are apple macs. however, one of them is an intel powered macbook pro which has the ability to run windows through a desktop application called parallels. if you happen to be a windows user, it's admittedly a much simpler process to simply install the srm software on your computer. now before you check to see if this is still a cycling website, let me point out that i agree with you entirely, but if you need to employ a powermeter in your training schedule, this is stuff you are going to have to deal with whether you like it or not. bob at cyclepowermeters graciously explained much of this before i decided which power device i wanted to 'rent'. despite the fact that the powertap has mac compatible software, i figured that most cyclists were likely to want an srm, since it seems the higher profile device. it is possible to acquire mac software from powercoach, but the cost is rather prohibitive (£320+) and they have no demo version for you to try before you buy, which seems a bit short sighted if you ask me. so why bother with the software anyway? why nor just write down the figures at the end of the ride in your rapha training diary. i was there before you, because when the srm package arrived at washingmachinepost towers (only two days for delivery to the hebrides which is peachy keen) and i had a look at the accompanying literature, i came out in a cold sweat. so cold was this sweat, that i e-mailed bob to say that he might be receiving the box back sooner than he thought. there are several functions on the powercontrol that can only be controlled through the software, and to use the srm properly, you really need to be able to download all the info acquired on each session and have it displayed as a brightly coloured line graph. however, when the sweat had evaporated, i decided not to wimp out - the worst that could happen was a doctorate in computer science. with no budget whatsoever for ancillaries, i downloaded a 15 day trial version of parallels desktop and installed that on my macbook pro - that bit was very easy. i also borrowed a copy of windows xp (love the fact that windows is now just another mac application) which apparently works unfettered for 30 days without activation. since i only had the srm unit for 14 days, that really provided no problem. now i am generally quite competent with computers (everybody has to be good at something) especially applemacs, so the fact that it took about seven attempts to get windows installed properly should be something that you should take into consideration if this is a process you may find yourself involved with. i shan't lengthen this review by describing the problems windows gave when first installed. i can only tell that i had to uninstall windows to fix something it broke, then install all over again. why can't srm just do the decent thing and provide mac native software? after windows works, the srm software has to be installed from the cd provided and it's necessary to check that windows recognises the usb/serial cable supplied to connect the powercontrol unit to the computer. 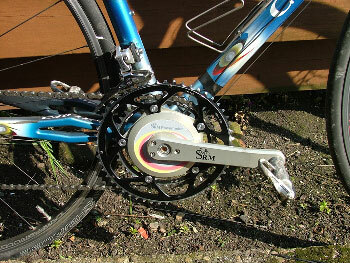 the delivered box contained, in this case, an fsa professional chainset with 53/39 rings and a left crank. there are also a variety of plug adaptors to accept the majority of powerpoints allowing charging of the control unit battery. most importantly, there is a split cable for affixing to the bicycle frame that reads the power output from the crank and the speed from the front wheel. rather surprisingly, in a pleasant sort of way, the control unit also reads polar heart rate chest straps, and provides a rather bizarre anomaly with the srm unit. if it can read polar units wirelessly, why the heck can't it manage the same with power and speed? this is 2007, we're using a piece of scientific equipment that costs nearly two and a half grand, yet it needs wires to work. surely the folks at srm can figure out how to download info to a computer using bluetooth or somesuch and have it read data wirelessly too? just like the powertap in fact. it's a shame that srm haven't taken a leaf out of the book of the big boys in the computer business - the connection point on the back of the powercontrol has five pins which marry up to five holes on the connection and usb cables. but as any right minded computer geek knows, if the pins get bent, it makes more sense to have them on an easily replaceable cable than on a frighteningly expensive srm unit. because no two frames are ever identical, bob suggested that i might have to be a bit creative in attaching the right bits to the right places. an ideal location for the power sensor would be on the right chainstay, but carbon bikes are likely to have a lot of chunky carbon around that area. this is true of the c40, so i took the cannondale approach and strapped it to the lower portion of the downtube, mere millimetres from the seat tube junction. this worked straight off. affixing the speed sensor proved a lot harder. ideally it should strap to the inside of the fork blade, but i was unable to find any position that didn't result in the magnet beating the heck out of the sensor. 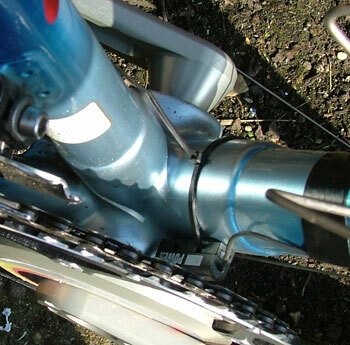 i eventually strapped it to the back edge of the fork with a bit of electrical tape. highly decorative, i don't think - but it worked. unfortunately all this cabling with attendant zip ties and black tape rather detracts from the natty paintwork on the company colnago, but heck, it's all in the name of science. ok, so i'm all set up and ready to roll, so what happens next? lots of numbers is the answer to that. the display on the powercontrol sparks into life the minute the polar chest strap comes close, and once the pedalling begins, there are even more numbers on display: distance, time elapsed, heart rate, cadence, speed and power output. if it wasn't for the fact that the low road between bowmore and port ellen is as straight as a die, there would have been room for distraction and frequent visits to the peatbogs off to the left. being one of those beings with an aversion to numbers, the novelty wore off quite soon, and concentration moved to enjoying a pedal on a sunny day. and you can happily ignore the numbers for ever and ever if you so wish, because when you get back home, showered, changed, face fed, the powercontrol unit can be plugged into the computer and the entire ride downloaded into the srm software. that's when the pretty pictures appear - coloured lines depicting each of the numbers that we ignored on the display. how you interpret all this stuff is entirely up to you, your coach if you have one, or both of you together. personally speaking, i have no real need of any of this stuff because i don't compete and because it all seems like too much work for this finely honed athlete (did i hear sniggering at the back?). the powercontrol can also have the mode changed to read average numbers and maximum numbers. cadence was the most useful part for me - i admit to finding that quite fascinating for no particular reason. i realise that i am being somewhat facetious about all this - if you are a competitive cyclist there is great value to this system. by looking at the graph, i was able to follow just where i was at each stage of my route and pinpoint where more power was needed or where my heart seemed in danger of exiting through the top of my head. all the info can be saved before clearing the srm unit, and assuming your coach is also in possession of srm software, this could be shared by e-mail. and now that cyclepowermeters are making these systems available to rent at such advantageous prices, even the lowliest of unsponsored cyclists can afford to use the same methods as the pro tour teams and the british track contenders. the srm professional unit on test here costs £190 which includes the first four weeks' rental and a deposit of £120. the latter is refunded when the package is returned. carriage within the uk is normally £9 though if you live in one of the more obscure parts of the principality, such as islay, this escalates to £22 (carriers check our postcodes and double the number they first thought of). check the details on their website: there are too many options available to cover here. and i'm not going to tell you what my average power output was because it would only make chris hoy feel insecure. just as a brief postscript to the above, if you decide to buy the powermeter within the first four weeks of rental, cyclepowermeters will deduct the cost of the rental from the cost of purchase. after four weeks, you can have 50% of the rental deducted from the purchase price. i believe this is what's known as a win, win situation.